Many of our lives have been touched by someone that has or had cancer; or know someone that does. With the recent diagnosis of caner for a friend and many others that have lost the battle to breast cancer; our fearless leader, Pharice, is doing more than just walking or running in this year’s Susan G. Komen Global Race for the Cure™. She is fundraising because the Washington, D.C. Metro Area still has one of the highest breast cancer mortality rates in the nation. And I believe that where you live should not determine whether you live. She also is raising funds because she has lost loved ones and friends to breast cancer. 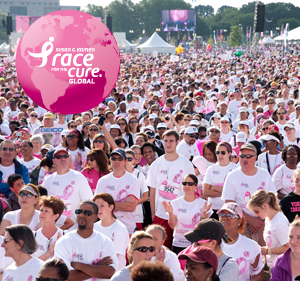 Up to 75 percent of funds from the Komen Global Race for the Cure support local breast cancer education, screening and treatment programs throughout the National Capital Area, including Washington, D.C., and parts of Virginia and Maryland. The remaining funds support Susan G. Komen for the Cure®’s work around the globe, sharing knowledge and experience and to fund education and breast health services in regions where few exist. Thank you. Your generosity saves lives! Join Word of Mouth Events & Planning on Facebook for all your event and meeting planning needs and post your events here too. We have given you our best information to make any event or meeting a success; follow our blog.